This past week, Facebook launched an update to its search feature that may give Twitter a run for its money – or at very least, some cause for concern. An announcement by Tom Stocky, VP of Facebook Search, on October 22nd, 2015, states that Facebook has indexed the website’s 2 trillion posts, and will now allow users to search for public posts across the entire social media site. Users can now use the search function to “find out what the world is saying about topics that matter to [them]” (Stocky, emphasis mine). The change is largely three-fold. First, users will be able to search for public posts outside of their immediate networks. 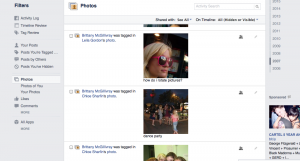 Secondly, Facebook will provide better personalized search recommendations and refer users to trending topics online. In this way, Facebook will act as a key source of breaking news and current events. Finally, the new search functions will also allow users to search directly for public conversations circulating around a specific topic, and peruse what people are saying across Facebook about a given link or event. 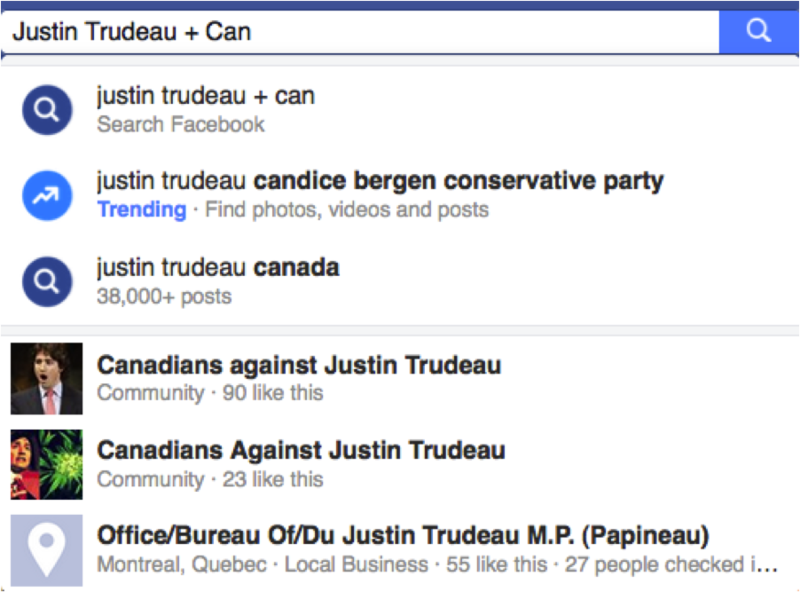 My search for “Justin Trudeau + Canada” yielded recommendations from Facebook partway through for “Justin Trudeau + Candice Bergen” as a Trending topic. Is Facebook Stepping on Twitter’s Territory? Somewhat. These changes, as stated by Stocky, will provide users with an “aggregate overview of sentiment” around a trending topic. By expanding search results to include trending, viral and popular posts alongside personalized results from users’ own networks, Facebook will both enable and propel users to use the site as an indicator of public opinion and to participate in worldwide conversations – without ever navigating away to another website. The search results, separated by Top Posts, Latest, and People, allow users to easily sort through ‘Verified’ news sources, their own friends’ posts, and other public indexed posts. As pointed out by ‘The Next Digit,’ the concept of a Verified or ‘trusted’ user (indicated by the iconic check-mark) has become familiar to web users largely via Twitter (Murphy, 2015). Adopting this hierarchy, Facebook will allow users to easily glean the top news stories from reputable sources related to their search queries. And in a very Twitter-esque fashion, users will be able to ‘pull-to-refresh’ the Latest News tab on their search results to stay up to speed with conversations as they develop in real time. An example of a Verified Source on Facebook, as indicated by the blue and white check-mark. In other words, your search results are a product of the data Facebook has already gathered from your Likes, habits, interactions – and even your cursor movement – online. And keeping users from navigating away from the site while searching for current events, trends and public conversations, will only contribute to the wealth of data Facebook has gathered on users’ interests, political affiliations, and browsing habits – information that could be valuable to advertisers and third-parties. In “an era in which we have become the resource for data collection that vampirically feeds off of our identities, our ‘likes,’ and our everyday habits,” the new search features could give Facebook the power, more than ever, to shape and cement users’ interests through their search algorithm, as the website comes to increasingly control which information users read or access online (Gitelman 10). Making past posts accessible – an ethical grey zone? These updates have already begun on Facebook for whoever uses US English on their desktop or smartphones. While the changes will not alter the existing privacy settings on users’ personal content, the new search features allow faster and easier access to past content that may have otherwise been buried from the public. For users unaware of these updates, the resurfacing of outdated content may be an unpleasant surprise – which begs the question, should Facebook have given users a more overt warning that their past posts will be so easily searchable? Is reminding users to manage their basic privacy settings enough of a precaution? danah boyd, founder of Data & Society, criticizes Facebook’s privacy settings as both the “most flexible and most confusing privacy settings in the industry.” She claims that privacy settings “shouldn’t be just about control; they should be about the combination of awareness, context and control,” and allow users to understand “the visibility of an act during the act itself” (boyd 2008). If Facebook search is enabling users to dig out old posts with greater power than ever before, does Facebook have a responsibility to make users aware of the new visibility of long-forgotten content? Furthermore, should Facebook enable new functions to make privacy more manageable retroactively– for instance, by allowing the privacy settings for tagged photos to be managed in one fell swoop, instead of forcing users to tediously scroll through years of posts in their Activity Log? Facebook Currently Requires You to Individually Select the Photos You Wish to Untag. As noted by WIRED, Facebook is “one of the world’s largest repositories of personal data” (Montcheuil 2014). As the site continues to grow and find new ways to compete with its social media rivals, Facebook’s functions are becoming ever-more powerful. Facebook’s improved search functions are equipped more than ever to “produce objectified individuals where the vast amount of capta” gathered around users is used to “classify […] and actively shape their behaviour” (Agre 1994; Graham 2005; Lyon 2002, via Dodge and Kitchin, 2011). While the ability to use Facebook to search for specific topics or posts may prove useful in keeping us informed on worldwide news and trends – and potentially limit the amount of time we spend scrolling aimlessly through pointless posts – our own understanding of data collection and ability to manage our online privacy has to stay up to speed. And with the rate Facebook is changing and accelerating, it’s very possible our own needs and concerns will be left in the dust. boyd, danah. “Putting Privacy Settings in the Context of Use (In Facebook and elsewhere)” danah boyd | apophenia. danah boyd. 22 October 2008. Web. Accessed 26 October 2015. Gitelman, Lisa. (ed.) 2013. Raw Data Is an Oxymoron. Cambridge: MIT Press. Introduction chapter.1-14. Marr, Bernard. “How Facebook is Using Big Data: The Good, The Bad and the Ugly.” LinkedIn. LinkedIn. 16 July 2014. Web. Accessed 26 October 2015. Montcheuil, Yves De. “Facebook: A Decade of Big Data.” WIRED. Conde Nast. March 2014. Web. Accessed 26 October 2015. Murphy, Wayne. 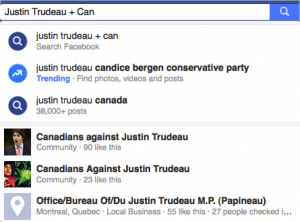 “Facebook Improves Its Search Bar; Refines The Results.” The Next Digit. The Next Digit.Com Media Inc. 25 October 2015. Web. Accessed 26 October 2015. Statt, Nick. “Facebook is unleashing universal search across its entire social network.” The Verge. Vox Media. 22 October 2015. Web. Accessed 26 October 2015. Stocky, Tom. “Search FYI: Find What the World is Saying with Facebook Search.” Facebook Newsroom. Facebook. October 22nd, 2015. Web. Accessed 26 October 2015.